Chicago, if you have not heard of Shuteye yet, know that this innovative local duo could be the next big thing in the electronic music scene. 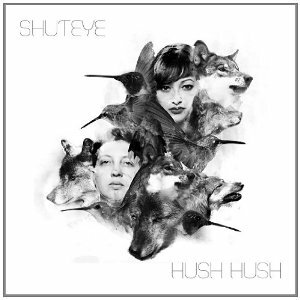 Shuteye released their debut album, Hush Hush, this year, with sounds that are soothing, diverse, inventive. The two artists, Alena and Elysia, both started out solo, but over the years have come to realize that two is better than one and combined their musical abilities and visions to create Shuteye. Alena and Elysia create music with meaning, music that doesn’t have any limitations. They do not clarify a specific genre for their music, which allows them a lot of creative freedom. Learn more about this duo in the interview below, and be sure to catch them around Chicago at their upcoming shows (January 3rd: DJ Set at Berlin with Kim Ann Foxman and Kid Color; January 4th: DJ Set at Neo with John Mork, Ryan Paradise, Chris Grant, and Trancid; January 11th: members of Shuteye, Kill Hannah and Echodroids are performing as Death on the Autobahn playing the music of Kraftwerk at Metro for the Sons of the Silent Age show). WCR: Music has been a big part of both of your lives since you were little--what initially drew you to electronic music? Alena: I've lived in Chicago since I was 8, so I've been listening to electronic music since I was a kid. There were always DJs on the radio and I was really into making mixtapes with DJ Funk and stuff like that back in the day. I then went to college in Champaign and there was a club called Orchid that was bringing in big name DJs every week. That's where I first got exposed to underground dance music and really fell in love with it right away. I started collecting vinyl and DJing in the year 2000 and got into production a few years later. Elysia: I started listening to a wider range of music towards the end of high school and quickly fell into loving electronic music. When I used to live in Cleveland, I started sneaking into bars when I was 17 and found myself going to smaller venues that would have a lot of great electronic bands play like Brazilian Girls, Chk Chk Chk, etc. There was this bar in the basement of a venue that would have packed dance nights, once a week, where they played a ton of electronic music. This was different for me because coming from a small town most people only knew what they heard on the radio. So the only way to find music like that when I was younger was to dig deeper in the city and on the web. I initially started experimenting and writing more electronic music when I moved out of my house for college. It forced me from playing the piano to the keyboard since that's all I could take with me. Your music is very unique, in fact, you created your own genre; what do you call it? Alena: Thank you! We've always tried to create music without really worrying about genres or having expectations. I think that's why the album (Hush, Hush) came out so diverse. I still don't really know what to call it, but I'm kind of more satisfied with not being able to put it into a category. Elysia: I have no idea… electronic-awesome? Haha. In all seriousness, it's what Alena said--we always just wrote what we felt, and what came to us, and never really thought about trying to fit into anything. I think that's the point of being creative though, in not worrying about what you want to sound like or what others might think. It's all about stopping thinking and getting lost in creating what feels right. For people who have never heard Shuteye before, what would be the perfect song to introduce new fans to your unique sound? Alena: I would have to say "Died." That's the most recent track we created together, and I feel like the production level is more current to our sound and where we are headed. Elysia: Mine would either be "Sun Night Sky" or "Died." Both are great songs that have different elements to them. I think both represent our sound very well. "Sun Night Sky," I especially love towards the end of the song because it completely changes and has an entirely different vibe from the rest of the song. You both had solo careers--what was the inspiration for the collaboration? How does it compare to your solo careers? Alena: For me the inspiration was doing something different and out of my comfort zone. At the time I was in need of a creative rebirth, and working on Shuteye was just that. It's definitely a lot different than working alone, there's a lot of compromise involved. You kind of have to teach yourself to let go of the control aspect because it's suddenly a shared responsibility and at the end of the day you're represented by more than just yourself. Elysia: When I had my solo career it was when I was 15. That being said, I had no idea really what kind of music I wanted to do then, and my knowledge in music and experience has changed drastically over the years as well as my writing. When I fell into electronic music, I finally felt more right in the world and more fulfilled. I always knew I wanted to find one other person as talented to collaborate with, so when I met Alena and everything was coming together beautifully in the studio, that's when I knew this was the collaboration and project I was waiting for. In working with another person it takes lot of trust in the other person’s abilities. There definitely was a lot of learning in both of us compromising on ideas and not being perfectionists, otherwise nothing would ever get accomplished. What about the Chicago music scene draws you to the city versus other places in the U.S.? Alena: Chicago is full of so much talent and has such a rich music culture. I feel really honored to have been here for some of it, and to be a part of the music scene. It's changed my life entirely. I gave up school for my path to pursue a music career, because once I found it I knew I wouldn't be happy doing anything else. It was really easy to be inspired and change everything when being here in the '90s with House Music and everything that was going on in the scene. It's such a cut throat no BS kind of city--it's always pushed me to work harder because the talent level was always so high and you had to earn your respect. Elysia: I love Chicago. Everyone here has been very supportive with what we are trying to do. I think there are a lot of great venues and talented local bands. There is always something happening here whether it’s big tours or music festivals, and seeing the liveliness in this city inspires me to work harder and succeed. Can you describe the process of creating songs amongst the two of you? Our album is made up of songs that one of us started and then we worked on completing together. It always starts with an idea, a loop, or recording and then we go from there. We both came into the project with a library of songs that we reworked and finished as Shuteye. We usually bounce ideas back and forth until we find something we want to work on together. We try not to have expectations and just write with spontaneity. What is something that separates your music from the rest of the electronic/dance music scene? Alena: I think its diversity separates it. The songs are all different from one another, and I think the future releases will be different as well because of the way we write. I think that can reach a wider audience because there's something for everyone. My mom even plays our album for her wine club in San Francisco--haha. It's a great feeling when a different generation can get into your sound on the same level as the target audience. Elysia: I think certain elements in the music we write make it stand out a bit from a specific genre. I've noticed our music hits a wider range of people. I think all of our songs sound and hold something different to it, yet they all fit well together on the album. A big thing of mine that I think is different from a lot of music I hear is in how I like to play around with my vocals. For example, "Sun Night Sky" has so many random background vocals that come in and out sporadically, and especially in the end, it’s like a bizarre and beautiful choir of vocals. To me the effects, whether the echo or harmonies, are just as important as every sound in the music. I was never one for songs that had the same loud belting vocals pushed in front of the music and singing constantly straight through. In my mind, the vocals aren't just what should be up front in the song all the time. It too is like an instrument and is weaved in the song just like every other sound, allowing the song to breathe and be more diverse in sound and feeling. What venue in Chicago would you love to perform at? Alena: We've performed at lots of them already, but I think as a live act I'd like to perform at Congress Theater. Getting to DJ there and open for Crystal Castles was a crazy experience, I'd definitely love to do a live Shuteye set to that crowd. Elysia: I'd really like to perform at Lollapalooza or Pitchfork. I know they're not venues but they're festivals we definitely want to be a part of one day. Can you describe the significance behind your album artwork for your CD Hush Hush? Alena: I actually have a tattoo of that same hummingbird on my arm. It's dedicated to my friend that passed away last year, who also inspired the song "Died." We're both really into animals and their symbolism; the wolf and the hummingbird both had a lot of meaning for us so we chose to have them on the cover and around us. The hummingbird is known as the messenger and stopper of time, it can also fly backwards teaching us you can look back on your past but must not dwell on it. It's a symbol of love and beauty, and teaches us to savor each moment and appreciate the things we love. Elysia: I just remember having an experience as when I was a kid with a wolf that really stood out to me. It's the only time I came face to face with one. It found me before I saw it. I was looking another way, yet had this feeling to look right where it was. I'm not sure how long it was standing in front of me staring at me, but the way it looked at me, I just remember I was in complete amazement and felt connected, calm and safe. Later I learned it symbolizes loyalty, guidance, compassion, freedom, and family which is very much a part of who I am in my values in life. For Shuteye perhaps it's a good thing because it also symbolizes teamwork! Hush Hush is very emotional, soothing and moving; can you describe what the album means to you and where the inspiration came for the album? Alena: Thank you! I've always communicated better through music. I've never felt more at peace and as myself than when I'm DJing, or working in the studio. I'm more emotionally connected to melodies, and like to tell a story through the music. I think House Music really made me appreciate the importance of each sound in a track because you can remember how a hi-hat or clap coming in made you feel, and how much energy a single sound can create. Everything in the tracks was chosen piece by piece and it all kind of just came together, so there's emotion and purpose in everything. The song "Died" is especially significant to me because I started writing the music right after my friend passed away and it was the only way I knew how to cope with what had happened. Every little sound in that track was created with so much emotion, and I think it really translated into the final product. Elysia: I many times feel there are things that I want to express in feeling that only words hit the surface in. Everything written through the music and through my vocals… from the high beautiful sounds intertwining and playing off the lower heavier sounds were used more to express my emotions and current state of mind than the lyrics themselves. If you listen to what I'm singing, some of it is very surfaced and could be applied to a broad number of things which I like leaving open to better fit for people's interpretation to things in their lives. However, I myself know deeper in what it is I was conveying in those songs. During the process of this album, I went through a lot of hardships that put me on an emotional roller coaster and expressed it through every layer of the songs whether through voice or music. So for me, songs in the album were about anything from people who passed away in my life and the idea of having freedom from a solid structure yet still being pulled to earth by the ones who mourn and can't let go, wishing and dreaming to rewind time or having more, broken hearts and pushing yourself to stay strong, the acceptance in failure of a marriage, wanting to save myself and other people from past and constant mistakes, darker moments, constant dreaming, and also wanting to express and show something so out of this world beautiful that I wish others could see or feel.